Want to see an actual Bearcat, in person? Well you have a great chance now at the Cincinnati Zoo. If you are a student, faculty member, or staff member with the University of Cincinnati you can get into the zoo for 1/2 price now until May 25th (with an ID). The Cincinnati Zoo's Executive Director and the UC President Nancy Zimpfer kicked off the Bearcat's return to the Cincinnati Zoo. In addition to the return, this baby Bearcat still needs a name. 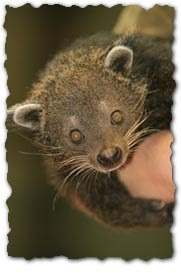 The public can enter into the Zoo's, "Name the Baby Bearcat" contest until April 30th...with a winner being announced on Friday, May 9th.